In response to stakeholder feedback, the U.S. Department of Agriculture (USDA) has released a Food Buying Guide (FBG) mobile application for child nutrition program operators. The app contains the same information that’s found in the interactive Food Buying Guide online. 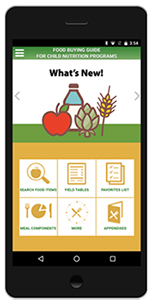 FBG is USDA Food and Nutrition Services’ first mobile app. “This new app allows child nutrition program operators to access the guide when and where it’s convenient for them, so they can do what they do best—serve nutritious meals to our children.” Brandon Lipps, acting deputy under secretary for USDA’s Food, Nutrition and Consumer Services, said in a news release. The Food Buying Guide can be used for all child nutrition programs, including the National School Lunch Program, School Breakfast Program, Summer Food Service Program and the Child and Adult Care Food Program. It aims to help with cost savings and improve program efficiency by allowing operators to know how much food they need for their program. The app includes food yield search, comparison and navigation features for more than 2,100 foods that are often served in schools and child care settings, and it allows users to create favorite foods list for quick access. The Food Buying Guide also provides information about meeting meal pattern components and provide additional menu planning resources. Currently, FBG is only available on the iOS platform, but FNS plans to launch an Android version at a later date. It can be downloaded for free on FNS’ website or on the Apple App Store.